©1975 Universal Pictures. All rights reserved. The film was transferred to video without unsqueezing the anamorphic 2.35:1 Todd-AO 35 image. As a result, the entire film is squeezed in on the sides. It would look great on a 16x9 television set, when configured for widescreen. The 24fps 3/2 pull down is done wrong, and almost all the freeze frames flicker. The film is still running at 24 frames per second, it's just the wrong fields are assigned to frame numbers. 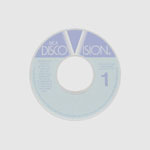 The video transfer is sharp, but suffers from the all too typical DiscoVision fault of being too dark. As a result, fine details are lost. What picture is present is full of color. 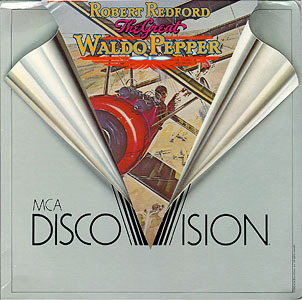 The audio has some of the widest dynamic range I've heard on DiscoVision, but it wasn't on purpose I'm sure. The high ends are rather tinny and take a bit of getting used to. On the replication front, most copies have minor speckling. 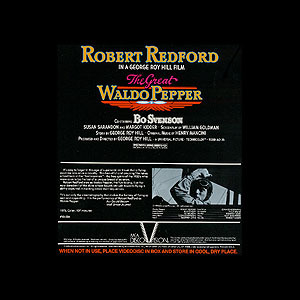 The Great Waldo Pepper was reissued on MCA Home Video (Catalog #: 10004) as a 2 sided CLV disc in May 1987.